陈楠, SudipBHATTRAI, 唐豪. 温度扰动对ODW结构影响的数值模拟[J]. 北京航空航天大学学报, 2018, 44(7): 1537-1546. 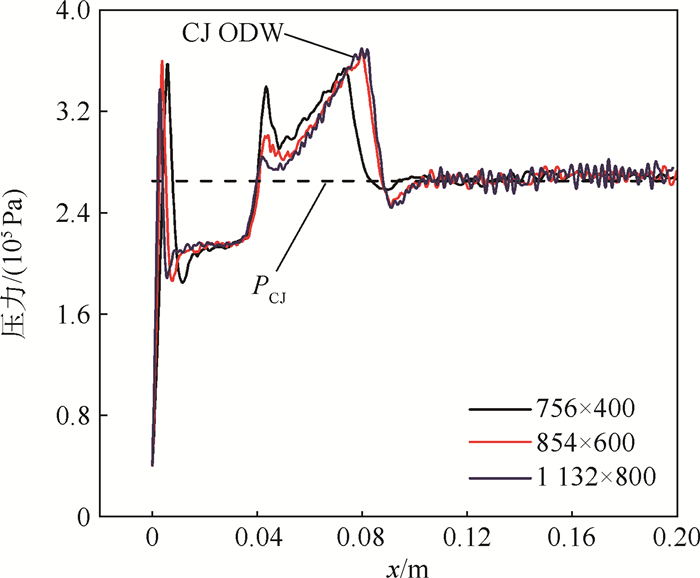 CHEN N, Sudip BHATTRAI, TANG H. Numerical simulation of influence of temperature disturbance on oblique detonation wave structure[J]. Journal of Beijing University of Aeronautics and Astronsutics, 2018, 44(7): 1537-1546. Abstract: 2D Euler equations were used for the numerical simulation of the influence of temperature disturbance on oblique detonation waves (ODW) in an oblique detonation combustion chamber. Instantaneous variation of temperature was introduced from the inlet as the disturbance by increasing and decreasing 100 K respectively. The simulation results show that the ODW can adjust with the temperature disturbance and the transition progress is smooth enough. But the inherent instability of ODW is found to be further released by disturbance and cell structure is clearer. The existing form of disturbance was researched quantitatively and qualitatively, which is the complex of shock wave, expansion wave and weak compression wave. 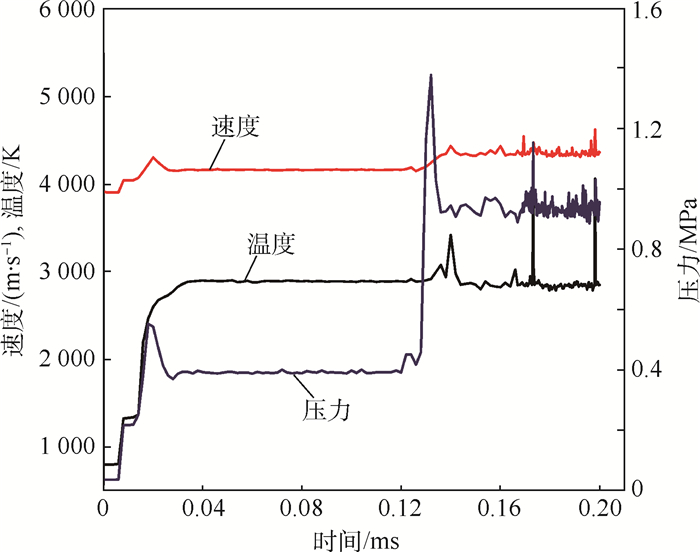 Comparison between the results from two kinds of disturbance was conducted, which demonstrates that the distribution of waves is basically the same in detonation zone, while reversed in deflagration zone. It is caused by the difference in the strength of weak compression wave in two cases, which effects the ODW structure enormously in consequence. 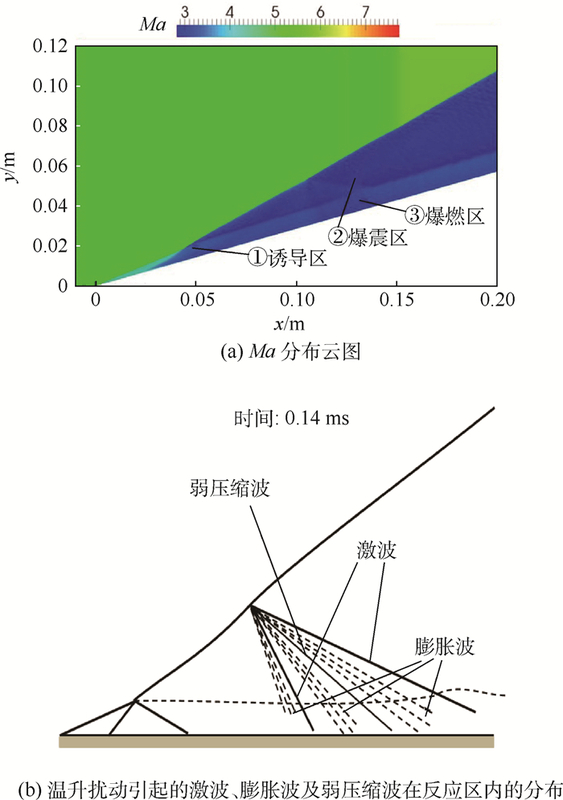 Furthermore, at decreasing temperature, the complex of three kinds of wave propagates downstream along the ramp and shock wave appears in four types of form which are bow-like shock, Mach reflection, regular reflection and normal shock nearly vertical to the ramp. There is an enormous bifurcation at increasing temperature, where the waves propagate along the surface of ODW and the form of waves remains stable relatively. 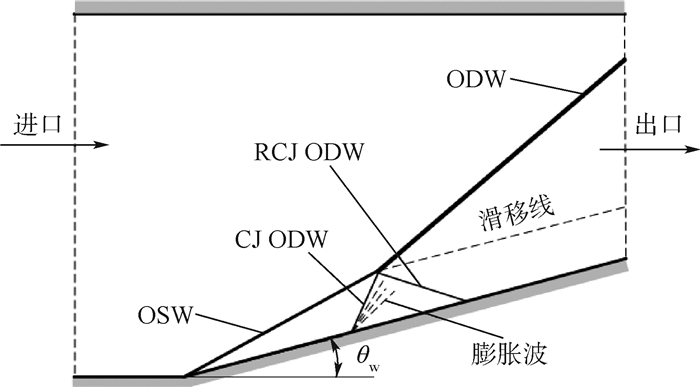 DENNIS E G, DAVID T D. Numerical modelling of standing oblique detonation waves: AIAA-88-0063[R]. Reston: AIAA, 1988. 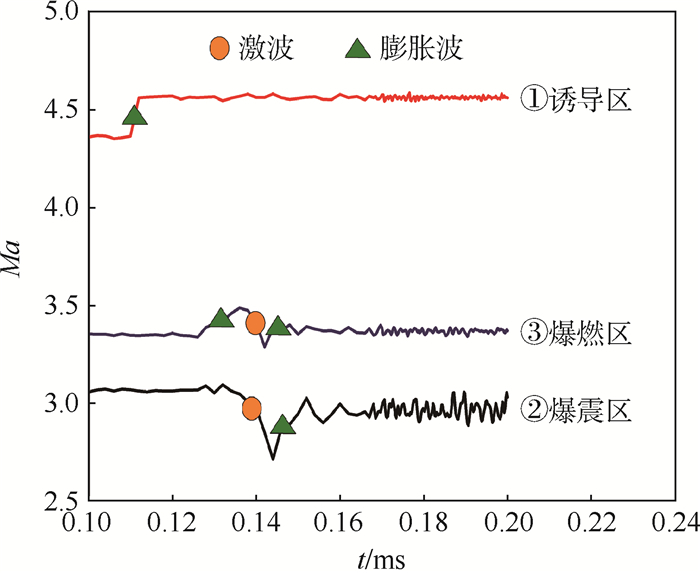 TENG H H, JIANG Z L, NG H D. Numerical study on unstable surfaces of oblique detonations[J]. 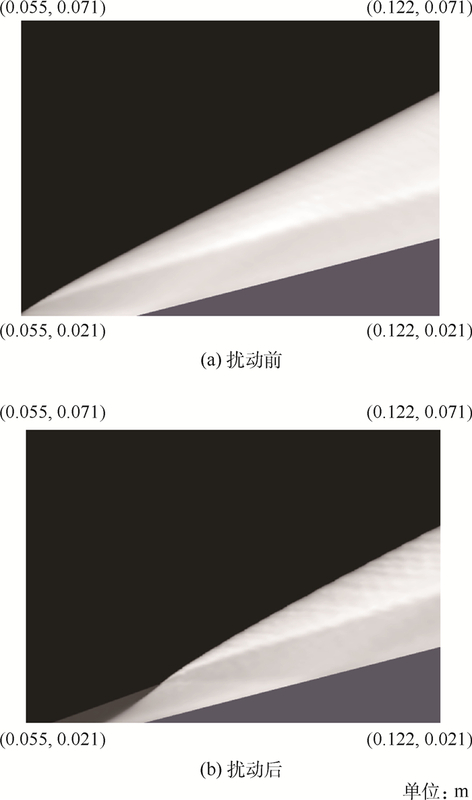 Journal of Fluid Mechanics, 2014, 744	(2): 111–128. 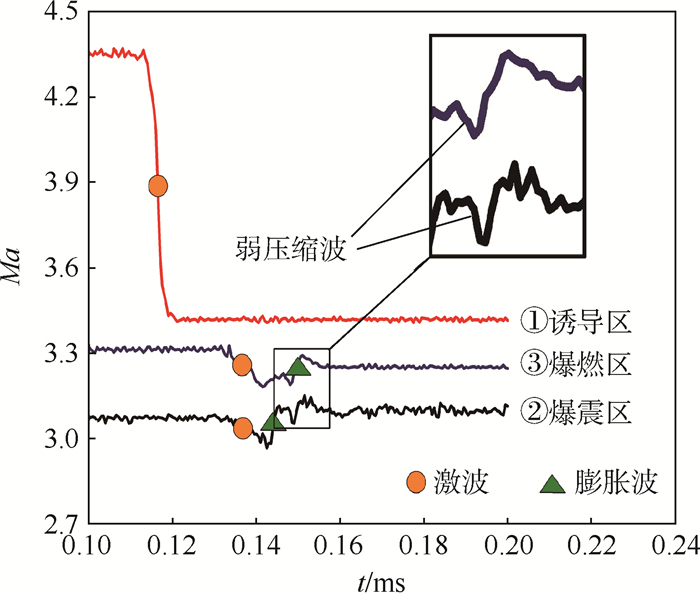 TENG H H, JIANG Z L. On the transition pattern of the oblique detonation structure[J]. Journal of Fluid Mechanics, 2012, 713	(6): 659–669. TENG H H, NG H D, LI K, et al. Evolution of cellular structures on oblique detonation surfaces[J]. Combustion & Flame, 2014, 162	(2): 470–477. 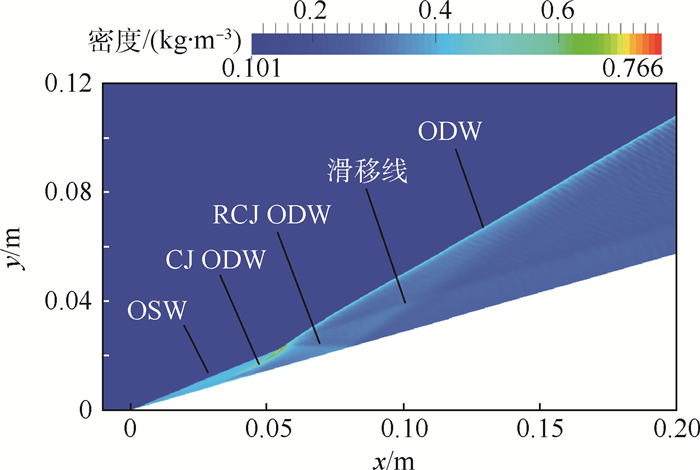 TENG H, NG H D, JIANG Z. Initiation characteristics of wedge-induced oblique detonation waves in a stoichiometric hydrogen-air mixture[J]. Proceedings of the Combustion Institute, 2016, 32	(2): 2735–2742. GHORBANIAN K, STERLING J D. Influence of formation processes on oblique detonation wave stabilization[J]. Journal of Propulsion & Power, 2015, 12	(3): 509–517. 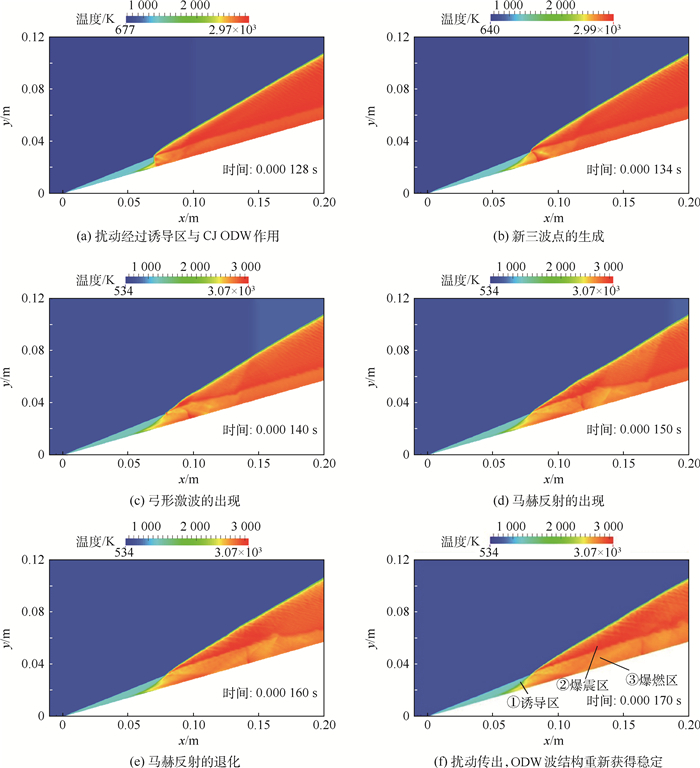 BHATTRAI S, HAO T. Numerical study of shcramjet combustor characteristic control techniques[J]. Frontiers in Aerospace Engineering, 2013, 2	(3): 189–198. 董刚, 范宝春, 谢波. 氢气-空气混合物中瞬态爆震过程的二维数值模拟[J]. 高压物理学报, 2004, 18	(1): 40–46. 姜孝海, 范宝春, 董刚, 等. 旋转爆震流场的数值模拟[J]. 推进技术, 2007, 28	(4): 403–407.